This week Lely has been highlighting recipients of the 2016 Future of Dairy Scholarship Program in Canada. Today we recognize Tamara Hamilton and Vicki Brisson who both live near Russell, Ontario and each were awarded a one-year, $1,000 scholarship from Lely. Hamilton is studying bio-resource management with a minor in environmental science at the University of Guelph. She has worked extensively in agriculture including on the family dairy operation, Hamildale Farms. 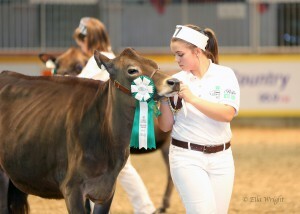 In addition, she was active in 4-H along with many other activities and honors. What does the future look like for the dairy industry? Some will argue that it is very unclear, and unstable. I believe, however, that the future of this industry is promising, stable, and reliable. As mentioned, the entire agriculture sector is going to face enormous challenges in order to feed the 9.6 billion people projected by 2050. To meet this food production will have to increase by at least 70 percent (Foord and Agriculture Organization of the United Nation, 2016). The only way to meet this is to increase the quality and quantity yield produced by farms. To support a rising population together everything must not just be economically efficient but also environmentally sustainable. Dairy production accounts for just 3 percent of our global footprint and farmers continue to work to minimize this. Automated milking and feeding technology can help allow efficient control of both food and waste. Brisson, who is studying animal science at the University of Guelph, also has worked extensively in agriculture including in a veterinary clinic and on dairy operations as well as other jobs. In addition, she was active in 4-H along with many other activities and honors. "L’équipement de traite et d’alimentation automatisée est un parfait exemple d’innovation, qui aura des répercussions positives pour le futur de l’industrie laitière. L’automatisation n’a pas pour but d’éliminer tout contact entre les agriculteurs et leur troupeau, mais agit plutôt à titre d’outil, notamment pour assurer la survie des fermes et d’une industrie unique et passionnante." Congratulations to all of the scholarship recipients.